26 | Kitchen & Bath Design News | August 2015 Trend Spotting body sprays that carry the WaterSense label," Zimmerman shares. This points to the power of the program's popularity; four years ago, there were barely any shower ofer- ings available. Digital showering sys- tems are also proving helpful to conservation, Zimmerman notes: "Show- er controls have become more advanced and can allow the user to program their showers in ways that provide a great experience while minimizing water consumption. Among the provisions of Cal Green (California's strict code) is a maximum fow of 2.0 GPM for a shower enclosure. 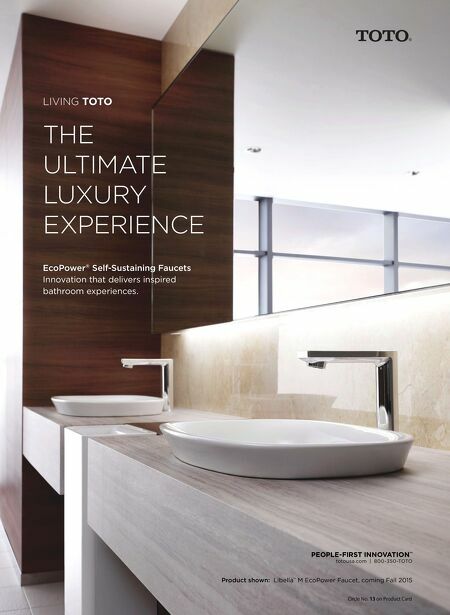 While this does not preclude a multi-head shower system, it does limit the design options." It will take some research and computations to keep your luxury shower clients in compliance and secure your building permits in a strict code state. TOILET SMARTS Traditionally, toilets were the larg- est water users in the home. This is shifting, Zimmerman observes: "New designs have come on the market, and toilets have become increasingly more water efcient and more pow- erful. Because of this combination of efciency and performance, 1.28 gallon per fush (GPF) toilets have be- come common everywhere, not just in California." That's both the state's and WaterSense's requirement; the current federal standard is still 1.6 GPF. "Flushing performance is vastly improved, even in the most efcient toilets, so concerns about double fushing are mostly a thing of the past," Zimmerman adds. "Toilets that use even less water are also avail- able, but there are fewer choices." That will likely change in the next three to fve years. OTHER FIXTURES AND GREYWATER RECYCLING WaterSense is not currently cov- ering bathtub or kitchen faucets. "Whirlpools and bathtubs provide a therapeutic option that many home- owners want," Zimmerman notes, "but most people who own them don't use them every day, so their impact on residential water use is quite small." They also provide an oppor- tunity for water recycling, through a greywater system. "It is very practical to incorporate greywater recy- cling into a remodel of the most-used bathroom in the house. Usually, the master bath is that room, getting at least two showers a day and an occasional bath," notes Bob Hitchener with Nexus eWater, Inc., a grey water technology firm. "If you connected only the master bathroom, you could gener- ate about 40 to 60 gallons per day," he shares. Grey water sy stem s also tap into hand sinks and washing machines. In a remodel, it's easiest to tie in a fxture or appliance if it's not sitting on a con - crete slab, Hitchener says. "The most practical remodel will be a ranch-style home built on a raised foundation." You can more easily add it into a new- home construction project or addition, but second-foor masters are doable. Typically, greywater is then used for landscape irrigation. "I see greywater usage becoming a much larger aspect of American homes in the near future," predicts Ron Voglewede, Whirlpool Corp.'s global director of Sustainability and another Alliance for Water Efciency board member. "Additionally, the use of rainwater collection will change how we design products in the home eco- system. Rainwater and greywater systems will have different water chemistry and potential challenges and opportunities." Whirlpool is testing these ideas in a live-in research home called the ReNEWW house (renewwhouse. com). ReNEWW stands for Retroft- ted Netzero Energy, Water and Waste. Whirlpool is working with Kohler to make the home net zero water, captur- ing and reusing its entire consumption this summer. "We're learning about the interactions between all of the uses and systems in the home to im- prove how all homes, both old and new, can work," Voglewede shares. APPLIANCE SMARTS Appliances are another area where you can offer your clients water savings. Washing machines and dishwashers are the big players in this arena. "For appliances, there are federally mandated minimums set by the U.S. Department of Energy (DOE) and voluntary more efcient standards set by the EPA with their Energy Star Program," explains the Whirlpool executive. Many consum- ers (and even professionals) are not aware that EnergyStar covers wa- ter conservation, along with energy savings. 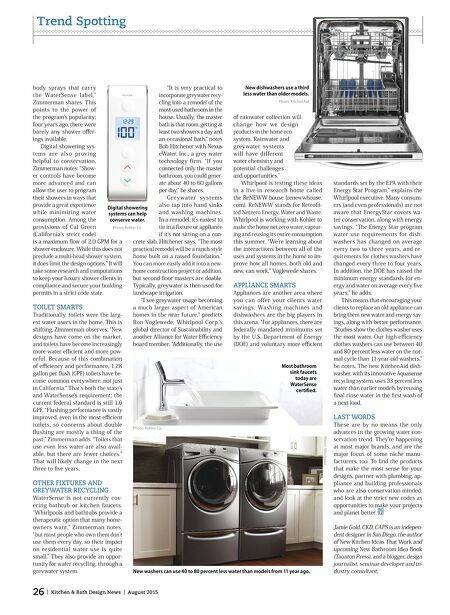 "The Energy Star program water use requirements for dish- washers has changed on average every two to three years, and re- quirements for clothes washers have changed every three to four years. In addition, the DOE has raised the minimum energy standards for en- ergy and water on average every fve years," he adds. This means that encouraging your clients to replace an old appliance can bring them new water and energy sav- ings, along with better performance. "Studies show the clothes washer uses the most water. Our high-efciency clothes washers can use between 40 and 80 percent less water on the nor- mal cycle than 11-year-old washers," he notes. The new KitchenAid dish- washer, with its innovative Aquasense recycling system, uses 33 percent less water than earlier models by reusing fnal rinse water in the frst wash of a next load. LAST WORDS These are by no means the only advances in the growing water con- servation trend. They're happening at most major brands, and are the major focus of some niche manu- facturers, too. To fnd the products that make the most sense for your designs, partner with plumbing, ap- pliance and building professionals who are also conservation-minded, and look at the strict new codes as opportunities to make your projects and planet better. Jamie Gold, CKD, CAPS is an indepen- dent designer in San Diego, the author of New Kitchen Ideas That Work and upcoming New Bathroom Idea Book (Taunton Press), and a blogger, design journalist, seminar developer and in- dustry consultant. Digital showering systems can help conserve water. Photo: Kohler Co. Most bathroom sink faucets today are WaterSense certifed. New dishwashers use a third less water than older models. Photo: KitchenAid New washers can use 40 to 80 percent less water than models from 11 year ago. Photo: Whirlpool Photo: Kohler Co.